What is both a telephone and a wallet? A way to order taxis, movie tickets, and even meals? An app where you can video-call with your most intimate friends, and a platform to share aesthetic photos to the world? To most people in China, their answer would be WeChat. As the most important social network in China that an average Chinese checks about 10 times a day, it has expanded into one of the largest messaging apps in the world over the course of 6 years. Its primary feature being messaging, WeChat has also developed plenty of popular features as well – including money transfer and payment, official accounts, Moments (a social feed for friends’ posts), and many more. As for international students studying and living in China, WeChat can be a helpful tool by both shortening the distance between each other and assisting us in our academic lives. It achieves so with special features that might otherwise be overlooked, and will be introduced below. They say a picture is worth a thousand words. A GIF? Probably worth a thousand texts. In WeChat, users can add stickers to their “gallery,” an assemblage of both downloaded collections and customized animated stickers that can be sent in private messages. You can access them in the emoji’s and stickers tab when on the direct and group chats’ interface, as they are automatically sorted into categories of “Favorites” and separate collections. When finding the sticker tab for the first time, surely most of us spent hours poring over all the choices and sending them out to watch the animation. To access default stickers and themed sticker collections, you can find “downloads” in the gallery selection. Hundreds of compilations, ranging from adorable cartoon characters to clever memes, are available to your personal gallery with one tap. Every several months, the sticker store also updates debuts of new collections, sometimes to jump in on current trends and celebrities. In fact, some sticker collections that brought publicity to WeChat when it first started are worldwide characters now – including Tuzki, Frog and Horse, and Rumi. In the “Favorites” tab of the gallery, there is the choice of adding custom images and GIFs to your stickers. Users can convert a photo (and even remove the background of some), and send the meme of a friend’s face in a chat. Moreover, you can create animated stickers of your own by saving and importing GIFs from your mobile phone album, which automatically generates a sticker of it. To acquire hilarious GIFs, there are online sources where many animated video clip files can be found. For example, Giphy is a massive database of categorized GIFs where users can also upload and edit their own clips. Therefore, next time when a friend sends you a sarcastic text, throw them a perfect comeback with an Anderson Cooper eye roll. One of the perks of being in such a well-connected community – buzzing with liveliness and rapid changes – is that China has perhaps one of the most convenient food delivery services. Despite the quick and easy ways to deliver food already with specialized apps, WeChat is now developing the same food delivery options all in one app. For example, restaurants like Wagas and Haidilao already offer meal reservations and orders via subscription accounts. When entering the official accounts of certain restaurants, there is often a “delivery” or “reservations” tab where you can choose your orders from the full menus accessible in those accounts. Users are also able to use WeChat wallet payment after filling in the addresses to submit the order. Have you ever waited in a crowded line for hours, standing and blandly scrolling through your phone, just to get a spot in a restaurant? If waiting in line in restaurants, or even other stores such as hair salons, you can spend your time grabbing a drink or wander around the surrounding shopping mall now without worrying about losing your spot. By following the official accounts and leaving your phone number down, reminder WeChat messages would be sent when you are called to dine. WeChat now also offers reservations in the app without having to make calls or visiting the restaurant in person, as users can simply select the dining times and number of people to submit their reservations. New services emerging at our fingertips increase the convenience and pleasure of our dining experiences. Honestly, who would resist the thought of both food delivery and texting in a single app? 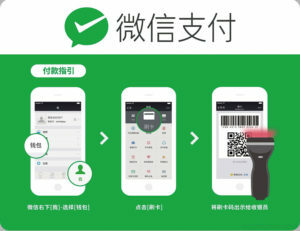 Perhaps many would use WeChat pay for enabling purchases – when shopping, sending transactions, buying food, and even gifting hongbaos, but how many have used it to support a good cause? Tencent Charity is a WeChat feature that users can access from their wallet screen, where you can donate to nonprofit organizations including Wardrobe of Love, Ofund, etc. In the main Tencent Charity interface, you can find lists of causes sorted into categories (including medical assistance, environmental issues, poverty alleviation, etc.) of both ongoing campaigns and urgent causes. In each campaign program, the number of people who have made donations to it or shared awareness of the cause as well as the total amount of money collected are specified. Although these online charity platforms are only in Chinese, it has still created a successful upsurge in people making charitable donations. As for students looking for community service opportunities, there is also volunteer work that can be accessed from the “Public Services” tab under the wallet section. Similarly, the volunteer work is also categorized into the causes of choice, and there are services specific to the season, the neighborhood, and different groups of people in need of assistance. For instance, dressing up as Santa Claus to bring presents to a local orphanage on Christmas is an example of those citizen-led campaigns. Users can check the time, location, and number of people involved in the service, and accumulate points for each hour they devote to volunteer work. Combined with the Tencent Charity feature, WeChat users can contribute a little to the society around them – acting both globally and locally to serve as they see fit. As WeChat’s primary function, messaging features can be especially useful when having to discuss with groupmates and teachers about school work, as well as contacting dear friends when they are away. WeChat incorporates many features that can be found in other messaging apps, but includes them all in one app – such as the voice call and video call functions like that of Facebook Messenger, press-and-release video clips like Snapchat, voice messages, etc. The group chats in WeChat are especially helpful when organizing group projects and activities. By including all members of the group to share files, links, videos, pictures, and much more, all members are able to discuss, learn, and complete assignments anytime and anywhere after school. The tagging function in texts is also convenient for allowing you to alert or remind group members or teachers for direct questions. When working on a long-term project or one with specific guidelines, the “Group Notice” is also a useful feature in these chats. It can be found in the chat setting screen, and a schedule, plan, or rubric of the project can be posted there to ensure that it does not become lost among numerous exchanges of text messages. Finally, when preparing for a presentation, a performance, etc., the video call function can be useful in rehearsing for the actual project by visualizing and polishing the roles that each member performs to effectively get the message across to the audience. As technology connects us further and further, distance becomes more insignificant when it comes to contacting friends overseas. You and your friends can create a group chat to make group voice calls and video calls at any desired time, and the picture and video clip features allow you to take snaps to share with all the group members. The voice message function can also help you “speak” to a friend and hear their voice responses despite time zone differences. WeChat is known for its ability to connect users, as the convenience of chat features all promote a smoother and more efficient mode for comunication than we ever thought possible. 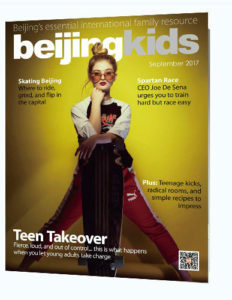 This article originally appeared on p18-19 of beijingkids September 2017 issue.